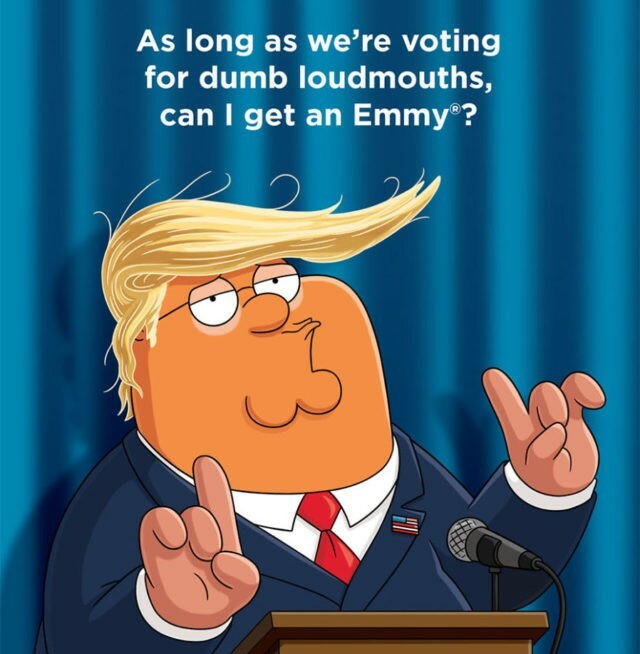 Seth MacFarlane’s animated Fox comedy Family Guy took a swipe at Donald Trump this week in one of its traditionally controversial Emmy campaign mailers. The artwork was posted to the show’s Facebook page, where it was quickly excoriated by fans. “Family Guy literally became less funny as they hired more and more liberal writers,” the top comment on the post reads. “What’s Family Guy? Oh yeah! It’s that show that used to be funny 5 seasons ago but now won’t go away… kinda like the Simpsons,” read another. Family Guy‘s Emmy mailers — sent to voters annually before the TV awards show — are often outlandish, and in some cases controversial. The show’s 2012 mailer featured a deadpan Peter Griffin imploring Emmy voters: “Come on, you bloated, overprivileged Brentwood Jews. Let us into your little club.” That stunt led several media outlets to refuse to run the ad. Family Guy has never won an Emmy in the Outstanding Animated Program category, and was last nominated for the award in 2006. The show was last nominated for Outstanding Comedy Series in 2009. It won two technical Emmys in 2010 and 2011, for individual in animation and sound mixing, respectively. The Fox animated show is currently in the middle of its 14th season. While it has struggled in the ratings recently, ratings-tracking website TVByTheNumbers predicts the show is a sure-fire bet for renewal next year.